We have plenty of solid choices! I think that as long as we have this whole forum to play with, we may as well start threads for these cards based on the template idea so that people can post their picture progress and discuss whatever needs discussing; perhaps each of us "Tarot Doctors" (xcalibur, Lady Marle, rushingwind, and myself) could take a set of five and work from there as time allows? Thoughts? Meanwhile, Lady Marle, can you give us your reasons for the following choices as a starting-point for discussion? If you can contrast your choices with the ones that were previously discussed, I think that would help us get going quickly! I'm sure one of us could provide a little summary of the issues involved with each card if you don't want to go back and dig through pages of back-and-forth. Noticing the way you wrote "Tarot Doctors" my brain somehow interpreted as you not being fond of the term. If you folks don't like it we can always change it. At first I was confused about having Cyrus as the King of Cups (thought he'd make a better Knight of Swords, but I guess Slash deserves the position), but looking over it again I've grown fond of the balance -- Flea and Slash as Knight cards of Wands and Swords, while Ozzie and Cyrus as Kings of Pentacles and Cups respectively. Strangely enough, we can actually draw a story line here. Question: Drawing Flea, where do we position the wand? He doesn't have any. You don't realize how hard it was for me to not laugh at that last line. Just saying. As to the Swords vs. Cups question, I endorsed the proposal largely because, well... the Swords are a harsh suit. They're affiliated with Air and the intellect, and the King of Swords' association with arbitration and justice matches Masa & Mune very well (they are, after all, almost elemental beings, and ones which chose their master based on his fitness). The Cups suit is generally linked to emotion, caring, wisdom, and imagination. To me that's a better match for the courtly Cyrus and his role in the lives of Glenn, Leene, and the kingdom. Indeed, it suits me well. I agree. The association with air & intellect is yet another match. Mune is about knowledge, but they also rely on "wind power" attacks in the battles (tornado techs, slash, also "storing up tornado energy" to release the powerful vacuum wave). and they let you ride the winds to leave the mountain. XD I'm glad someone did. With the exception of Fool, Magician, Emperor, Hierophant, Hermit, Hanged Man and The Moon, until Lady Marle has some input, feel free to begin making threads for the major Arcana (is Page of Cups / Janus set in stone? If so, feel free to make that thread too) and we can begin discussion on the individual cards. I'm having a writer's / artist's block at the time being, but I'll cope up. First question: Where do we place the cups symbol? (No innuendos this time, unless you have a very wicked mind, you pervert you...) I've tried various ideas, including having a background, but no luck. 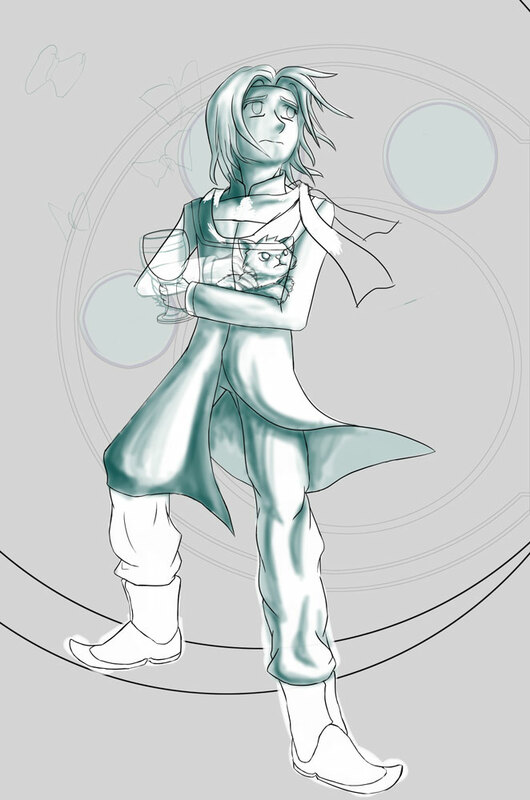 Second question: Besides Janus' attire, what color scheme would fit here? The theme of the card itself brings Glaucous to mind. Gentleness brings the color Powder Blue, Sweetness brings Amber to mind (which is also significantly related to "children" or "youth"), selfishness being Davy's Grey. Create, however, is an outburst of rainbow colors, especially highly saturated and illuminated colors. Third question: What kind of background and design are we thinking about? Fourth question: I can't figure out what to do with his right hand. I believe that Page of Cups - Janus is set in stone, unless someone else has a different idea. but I strongly believe that it's the best fit. also, Janus would most likely be holding a cup imo, like the rider-waite illustration. I'm not a graphic artist, but I would like to have input on the creative process. I might even do very rough drawings to show my ideas at times. As time permits (probably beginning tomorrow), I'll begin making some threads! Yeah, but what about the cup? XD I'm out of ideas. I've seldom dabbled into decor-designs that Laverinne excels at. Hmmm... The first thing that comes to mind for me is to have it falling in midair as though he dropped it when he raised his off-hand to pet Alfador (it might also be in the process of tipping over and spilling, although I'm not sure what that does to the symbolism). If he has to be holding it, the only place is in the crook of the arm not filled with kitten, and that would look a bit crowded/peculiar/silly. Crook of the arm... you mean like this?